How to visit Portland by bike. The ultimate guide. Biking is the best way to visit Portland, Oregon because you can look around and enjoy the city while getting to your destination a little bit faster, save money, be independent and completely emissions-free. 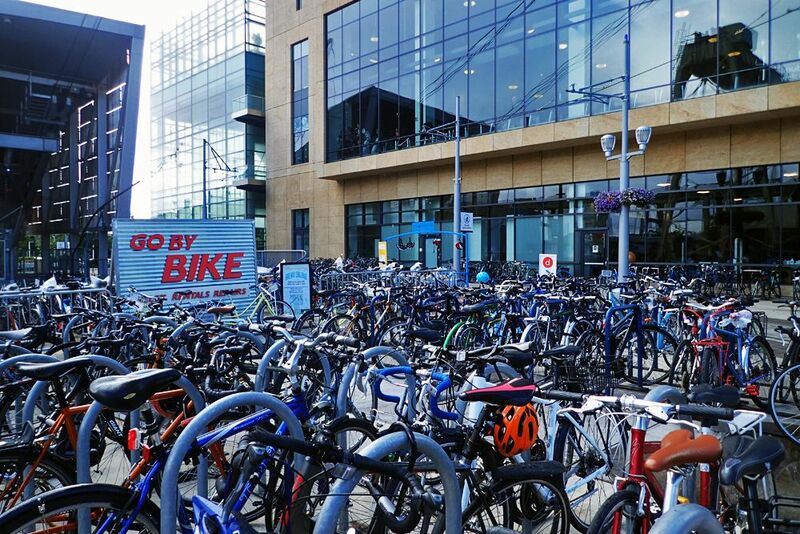 Renting a bike is easy in the 20+ locations and everything is in a 30-minutes bike ride radius. Portlanders created an extremely bike-friendly city so you’ll be given right of way, safe distance on the road, and find bike racks everywhere. It’s easy to bike with kids in Portland. There are hundreds of miles of bike lanes and if it rains, you can bring the bike on public transportation. There is little or no incline almost anywhere, so biking is easy. The map from Ride the City – Portland will be your reference, because of its flexibility and interactive tools. This map will tell you bike shops and rental locations as well as information about your route: safe, fastest, if you are on a reserved bike lane, elevation gain, and more. The map allows for only 2 points, start and finish, so I suggest having a physical map with you for multi-stop trips. Portland has 315 miles of bike routes. For a general idea of scale, from the I-205 on the east to downtown it’s about a 6 miles/45 minutes ride. I-205 is considered pretty far if you are visiting Portland (and not that close if you live in Portland), so the average bike commute is about 30 minutes in one direction. Biking is not difficult because the incline is fairly gentle unless you go in specific areas that are not in the center. There are many shops renting by the hour/day/month. You can refer to the Ride the City map above or to the City of Portland – Bicycle site. The City’s website covers any and all aspects of cycling in Portland, but it is not as interactive as the Ride the City site. Another link with useful information in one place is from Travel Portland, and the Oregon Metro link adds further streetwise information. You can also consider the bike sharing program BIKETOWN. The setup is different, you can use the bike for a flat rate only for a certain time per day, paying 10cents/minute if you exceed. Even though I suggest renting a bike, it all depends on how long you want to bike every day; what is the most cost-efficient deal for you; and if you want to keep your rental or not (e.g. if you are not staying in the city center). Use the bike lanes if you can and be careful near MAX and Streetcar rail tracks (avoid getting a tire stuck in one and fall). There are many options to visiting Portland by bike. You can join a guided tour, use a map, or join an event. Ride along the Willamette River in downtown Portland. The long loop (Google Maps route) will take you on both sides of the river. The two extremities are the red Broadway Bridge to the north and the new Tilikum Crossing to the south. One way is 2.5 miles (Ride the City map), and round trip is about 5.5 flat miles in bike lanes only. You’ll pass seven of the 12 bridges in the Portland Metro area that cross the Willamette River. Some of the bridges are listed in the National Register of Historic Places, such as the vertical-lift Hawthorne Bridge. You’ll ride along the westside green Waterfront Park where you can find a number of fairs and festivals throughout the year. 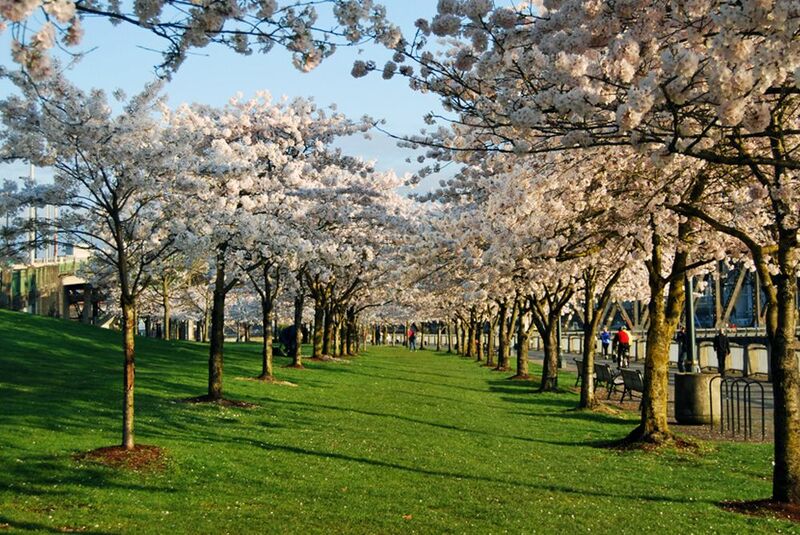 The cherry blossoms south of the historic Steel Bridge are spectacular on a sunny spring day, while the Waterfront Blues Festival is the US second-largest blues festival. Riding along the east side you’ll have the uninterrupted view of the whole downtown. Throughout the loop you’ll cross many runners, skaters, and fellow bikers. This loop can be a leisurely bike ride or a day-long trip. On the West side you can choose to: stop at the Lan Su Chinese Garden, two blocks from the Steel Bridge; enjoy the artsy-and-craftsy Portland Saturday Market by the Burnside Bridge on the weekends, which has many food stands too; visit the Oregon Maritime Museum. On the East side, the Oregon Museum of Science and Industry is always offering new exhibits. All are kid-friendly. You can criss-cross any of the bridges, but the Broadway, Steel, Hawthorne and the Tilikum bridges are the worthy ones. The ride connects the South Park Blocks to the Northwest area, the artistic Pearl District and the green Northwest District (Google Maps route). It’s a 4-mile round-trip in the core of Portland with limited incline. This loop also can either be quick or fill your day. By the South Park Blocks, you can find the Portland Art Museum (free entry the last Friday of the month), while inside the Park Blocks you can enjoy the food from the Farmers Market year-round on Saturdays. There is always live music there. Going north, grab something to eat at downtown’s largest food cart concentration at the Alder St. Food Cart Pod (there are no seating spots, but the food variety is huge) and definitely stop at Powell’s City of Books. 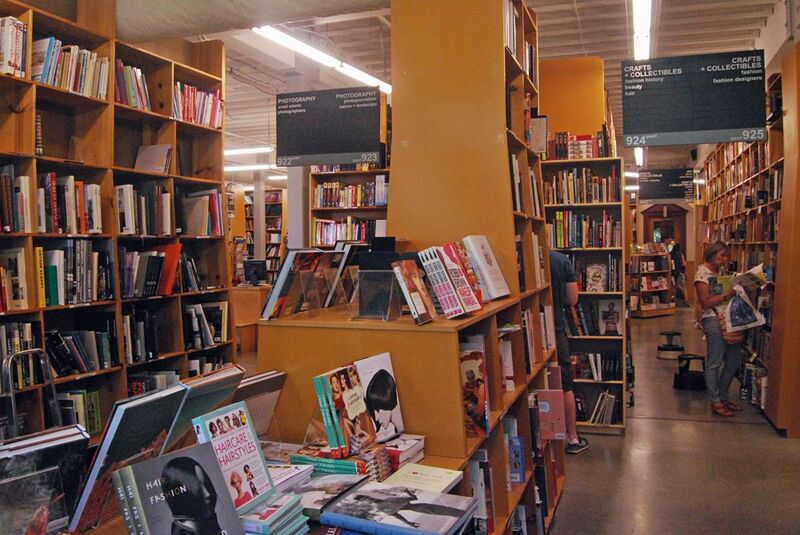 Powell’s is the world’s largest used and new, independent bookstore. It’s a whole block, multi-story enchanted world of rows after rows of books. The Pearl is famous for its independent shops; yoga studios; countless brew-houses and coffee roasters. The Northwest along NW 23rd and NW 21st is known for its many restaurants and shops, with a lively urban life from morning till night. Roam the East side neighborhoods. This is a more steady bike ride, because of the longer distances between the points of interest. The east side is a quiet and colorful blend of private homes, with lively hubs of activities, lush house gardens and tree-lined roads. The incline is limited (112ft) in a 4.2-mile one-way ride (Ride the City map). The two extremities are the Alberta Arts District to the north and the Hawthorne Boulevard to the south. Alberta is an explosion of color. The quirky houses are adorned with local artists’ work, while shops and restaurants abound. The monthly Last Thursdays street fair is the most famous in town, but some artists’ studios are always open. Hawthorne and its surrounding are dotted with vintage stores, thrift shops, and independent movie/theatres. Hawthorne’s dim yellow street lights disguise a busy nightlife. Other stopping points for restaurants or stores are E Broadway and E Burnside, but they can be quite heavy with vehicle traffic, so I suggest not riding along those roads. If you want to join an event, start by referring to the independent news source Bike Portland. Bike Portland takes you all over Portland, from Mt. Tabor (a former volcano) to the east, to strolling bike rides in North Portland. In any case, organized rides can also be found in these two main locations: Pedal Bike Tours and Portland Bicycle Tours. Both offer food or brew-themed tours or simple city tours. 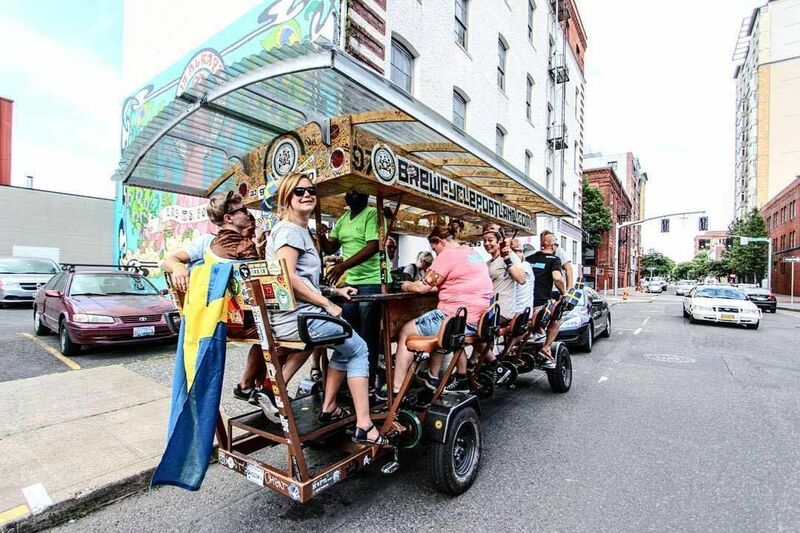 Two interesting beer related bike rides are offered by the Brew Group: the Brew Cycle and the new, original Brew Barge. You gather your friends, choose your beers and hop on the ride, where you pedal while drinking. The Cycle holds between 11 and 14 people and offers three different route options. The Barge is a 14-person cycle-powered vessel that allows you to float on the river at your leisure. Do your own ride, but also join a group ride.